The influences on Rogers’s music are extraordinarily diverse. Conductor Richard Baker describes how ‘Matt is strongly influenced by computer games music, but also references a variety of operatic styles, and there is one moment [in the opera] of near-perfect Sondheim pastiche’. The composer himself says ‘The music of Symphony X, Ozma, Hair Stylistics, Olivia Newton-John and Troyka has all had significant bearing on what I’ve written’. The Virtues of Things is orchestrated for string and wind quintets – in one sense a classical ensemble, but used by Rogers in highly individualistic ways. The Virtues of Things is Rogers’s first collaboration with librettist Sally O’Reilly, best known for her writings on art. The world premiere production is directed by Bijan Sheibani, a former Associate Director of the National Theatre, where his projects included Emil and the Detectives and the US tour of War Horse. 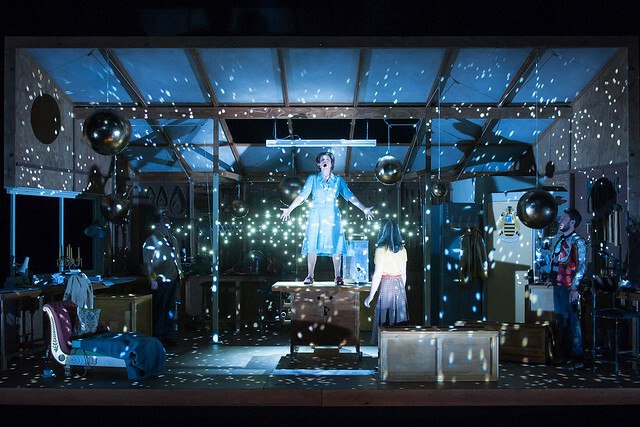 His regular collaborator Giles Cadle creates the designs, while Matt Haskins (Glare and The Commission/Café Kafka for The Royal Opera) creates the lighting design. Baker, himself a composer, conducts Aurora Orchestra in their tenth-anniversary year. The five singers of the cast complete a talented line-up that features some of the most exciting rising starts working in contemporary opera and theatre. The Virtues of Things is a co-commission and co-production between Aldeburgh Music, Opera North and The Royal Opera; its premiere in the Linbury Studio Theatre will be followed by performances at Snape Maltings and the Howard Assembly Room, Leeds. It is the second in an annual collaboration that began in 2013, the year of Benjamin Britten’s centenary. Inspired by Britten’s dedication to intimate chamber operas, the collaboration focusses on commissioning work on the ‘middle scale’: ‘This is no longer seen as just a scale for “artist training” – instead, the work is an opportunity to engage audiences in the most innovative and highest quality composition’, say Kasper Holten of The Royal Opera, Roger Wright of Aldeburgh Music and Richard Mantle of Opera North.